This beautiful landscape scene may be reminiscent of sandy deserts on Earth but it’s actually a valley slicing into the frozen ice of Mars’ north pole as seen by NASA’s Mars Odyssey, soon to become the longest-operating spacecraft on or around the red planet. The image above was created from several images taken by Odyssey’s THEMIS thermal-imaging camera between December of 2002 and February of 2005. As ice retreats from the edge of the valley, winds blowing across the ice send dark-colored sand onto the valley floor where it forms rippling dunes that travel westward. 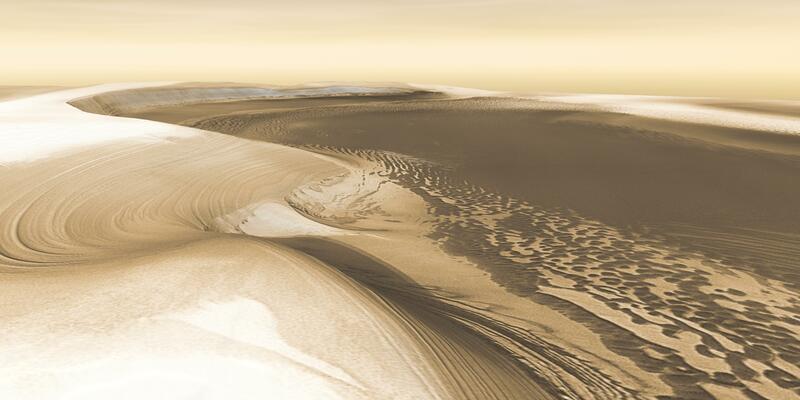 The ice-layered walls of Chasma Boreale rise nearly a mile from the floor of the valley.